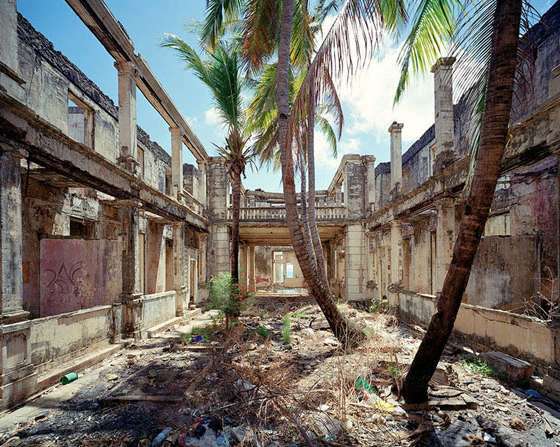 Traces of empire, the ruins of French imperialism, here is the new series of photographer Thomas Jorion, exhibited exclusively at the Galerie Esther Woerdehoff and accompanied by the release of a book published by La Martinière. Well known for his work on abandoned places (published under the title Silencio in 2013), the French photographer has spent the last years travelling the world to realize his new project on colonial history. PR Info _ If one is easily charmed by the pastel colors of decrepit walls, the quaint elegance of the architecture and the atmosphere of his photographs that echoes exotic readings and adventures, Thomas Jorion reminds us of this particular chapter of French history. He traveled throug continents, from Louisiana to Shanghai, from Guadeloupe to Senegal in search of a forgotten heritage, without a committment to exhaustiveness but with the desire to make a sincere portrait of the gone French colonial empire and its ruins. An gap separates the gates of Saint Joseph prison in Guyana, a villa in Indochina or the facade of the Rex cinema in Oran, yet all represent the last traces of the colonial empire. Courthouse, church, palace, building yard, slaughterhouse or factory, a lush vegetation sometimes invaded the buildings to swallow up constructions under vines and roots. Yet despite the peeling walls and cracks, they are not always deserted and their inhabitants enliven some photographs, as contemporary apparitions that seem to regain possession. Like the photographers of the 19th century leaving on expeditions to capture the outside world, Thomas Jorion adopts a heavy and bulky equipment, using a large format camera, and made the radical choice to use the last negative analogic films. Traces of empire photographs are portraits of places, landscapes, views of architecture but also testimonials, vanities of history and of the “glorious” past of the French Empire. Exposed as large stunning prints, the photographs of Thomas Jorion open windows on this somewhere else, a forgotten past that still affects our time.